Description KU-0060648 is a dual, ATP-competitive inhibitor of DNA-dependent protein kinase (DNA-PK) and PI3-K with IC50 values of 19 nM, <0.1 nM, 0.5nM and 4 nM for DNA-PK, PI3-Kδ, PI3-Kβ and PI3-Kα, respectively. The solubility of this compound in DMSO is limited. General tips for obtaining a higher concentration: Please warm the tube at 37 °C for 10 minutes and/or shake it in the ultrasonic bath for a while. Stock solution can be stored below - 20 °C for several months. Five-day exposure to 1 μM KU-0060648 resulted in more than 50% inhibition of cell growth in all cancer cell lines. KU-0060648 showed the greatest effect on growth inhibition of LoVo and MCF7 cells, the total cell growth of which over 5 days was only 10% and 4% of that of the control group, respectively. In mice bearing MCF7 xenografts, KU-0060648 alone resulted in a median growth delay of 30 days with negligible toxicity, and the combination of KU-0060648 and Etoposide Phosphate caused a median growth delay of 55 days with acceptable toxicity.
. Munck JM, Batey MA, Zhao Y, Jenkins H, Richardson CJ, Cano C, Tavecchio M, Barbeau J, Bardos J, Cornell L, Griffin RJ, Menear K, Slade A, Thommes P, Martin NM, Newell DR, Smith GC, Curtin NJ. Chemosensitization of cancer cells by KU-0060648, a dual inhibitor of DNA-PK and PI-3K. Mol Cancer Ther. 2012;11(8):1789-98. IC50: KU-0060648 inhibited cellular DNA-PK autophosphorylation with IC50 values of 0.17 μmol/L (SW620 cells) and 0.019 μmol/L (MCF7 cells), and PI-3K–mediated AKT phosphorylation with IC50 values of 0.039 μmol/L (MCF7 cells) and more than 10 μmol/L (SW620 cells). DNA double-strand breaks (DSB) are the most cytotoxic lesions induced by topoisomerase II poisons. 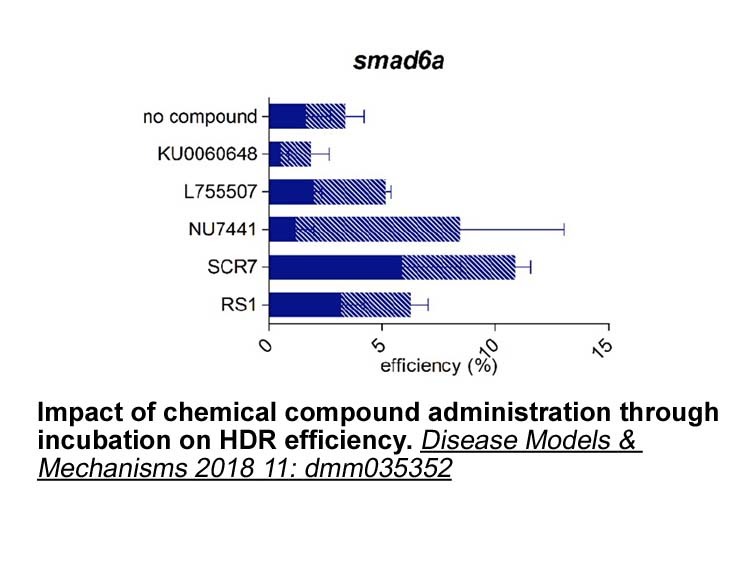 Nonhomologous end joining (NHEJ) is a major pathway for DSB repair and requires DNA-dependent protein kinase (DNA-PK) activity. DNA-PK catalytic subunit (DNA-PKcs), which promotes cell survival and proliferation and is upregulated in many cancers, is structurally similar to PI-3K,. 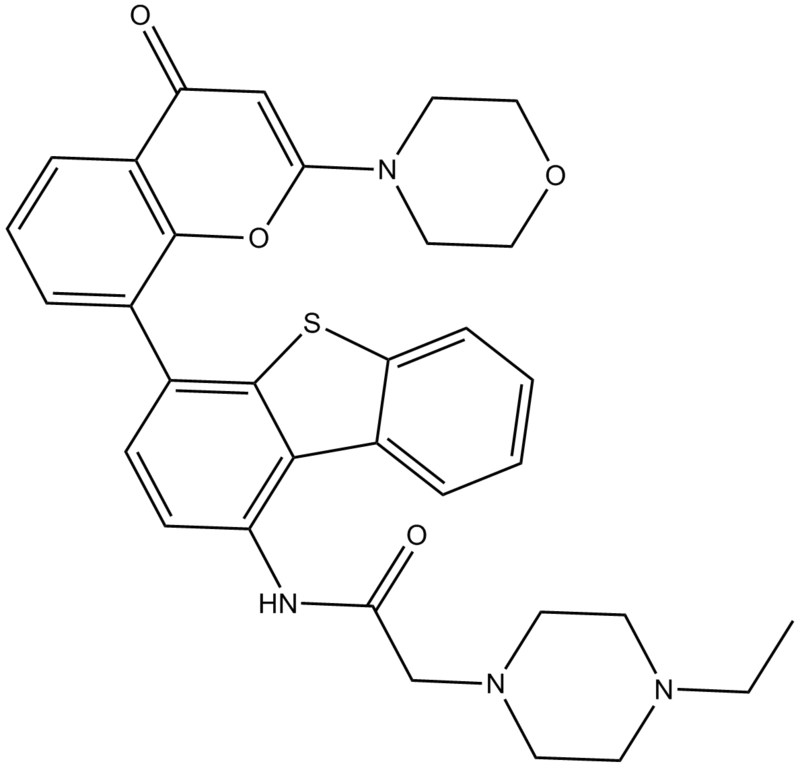 KU-0060648 is a dual inhibitor of DNA-PKand PI-3K in vitro. In vitro: KU-0060648 was investigated in a panel ofhumanbreast and colon cancer cells. Five-day exposure to 1 μM KU-0060648 was found to inhibite cell proliferation by more than 95% in MCF7 cells but only by 55% in SW620 cells. KU-0060648 increased the etoposide and doxorubicin cytotoxicity across the DNA-PKcs–proficient cell panel rather than in DNA-PKcs–deficient cells, therefore confirming the enhanced cytotoxicity was due to the inhibition of DNA-PK . In vivo: In mice bearing SW620 and MCF7 xenografts, KU-0060648 concentrations that were sufficient for in vitro growth inhibition and chemosensitization were maintained within the tumor at nontoxic doses for at least 4 hours. KU-0060648 alone delayed the MCF7 xenografts growth and increased etoposide-induced tumor growth delay in both in MCF7 and SW620 xenografts by up to 4.5 folds, without causing etoposide toxicity to unacceptable levels . Clinical trial: KU-0060648 is still in pre-clinical development stage and no clinicl trial is ongoing currently. Munck JM, Batey MA, Zhao Y, Jenkins H, Richardson CJ, Cano C, Tavecchio M, Barbeau J, Bardos J, Cornell L, Griffin RJ, Menear K, Slade A, Thommes P, Martin NM, Newell DR, Smith GC, Curtin NJ. Chemosensitization of cancer cells by KU-0060648, a dual inhibitor of DNA-PK and PI-3K. Mol Cancer Ther. 2012;11(8):1789-98.